Instagram and food go together like beans and toast. Did you know that 18-35-year-olds spend five whole days a year browsing food images on Instagram? Even 30% of them would avoid a restaurant if their Instagram presence was weak. Conclusion: Instagram can make or break your business, especially if you’re in the food industry. It’s a real holy grail for cafes, restaurants, and other food venues – and a fantastic opportunity to get found, attract new customers, and boost revenue. Don’t believe me? There’s proof! 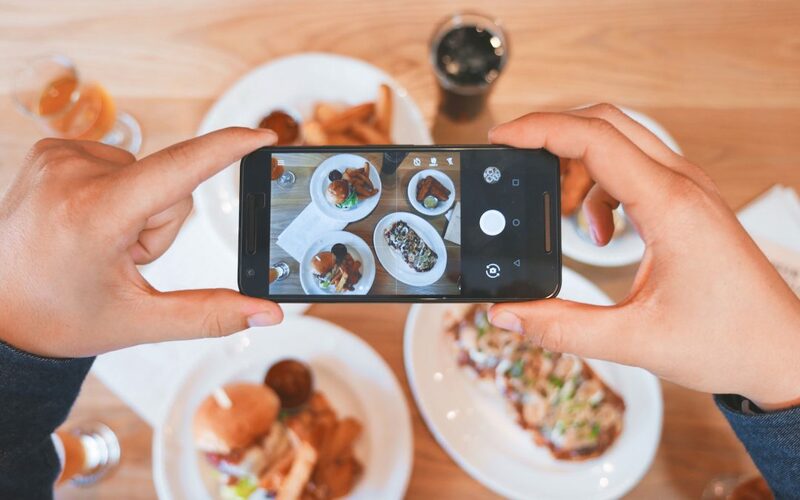 We recently completed a survey asking Instagram followers of food venues (restaurants and cafes) about the reason they’re following that particular venue on Instagram. That’s a pretty big percentage, and clear proof that Instagram marketing is well worth the monetary investment. As a digital marketer I get asked about ROI all the time, so let’s do some calculations and see how these percentages convert into actual ROI. That means that each new follower is worth £11.90. Not bad, right? But that’s not all! Don’t forget the fact that most people don’t dine alone – they bring their friends and family. More people = a lot more revenue for your business. The best part? It’s not all about revenue. With Instagram marketing you can grow your brand awareness, reach new influencers, and build partnerships. All by sharing great content with your audience. It’s just too good an opportunity for your restaurant or cafe to pass up. 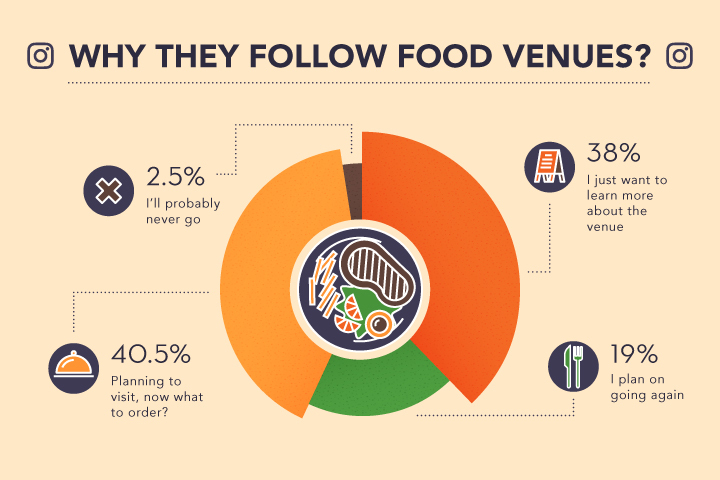 38% of the people we surveyed also said they’re following the food brand because they want to learn more about the venue. While these individuals may not be ready to buy just yet, they are great potential customers. After all, statistics show that 75% of Instagram users take action after looking at an Instagram advertising post. So, it’s your job to encourage and inspire them to take that step and visit your restaurant. However, know that this won’t happen on its own – you need a strong Instagram content strategy to convert potential customers into real ones. 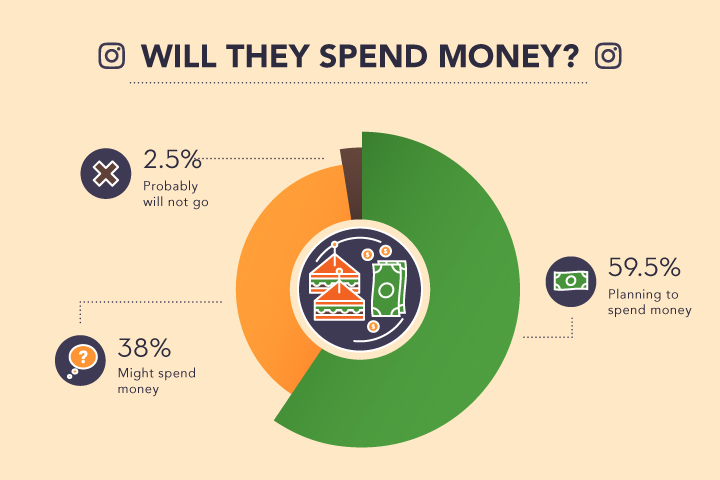 Don’t ignore the 38% just because they’re not ready to visit your restaurant just yet. Know that even if 10% of these followers become customers, it will have a positive impact on the business’ bottom line. Let’s go back to our scenario with 1,000 followers and £20 as an average spend. We’ve already established that approximately 595 of those people will visit and bring £11,900 in revenue. Even if only 10% of the 38% who are still on the fence decide to buy, that’s 38 more people, or £760 additional revenue for your business. Know that if you’re average spend per customer is even higher, Instagram as a social media strategy becomes even more attractive. Of course, Instagram marketing isn’t free and we need to factor in those costs. For the purpose of this example, let’s say the venue invested £1,000 on Instagram per month and grew the account by 300 followers per month. Again, this doesn’t include followers bringing other customers and the 38% of followers who may end up visiting at a later time. 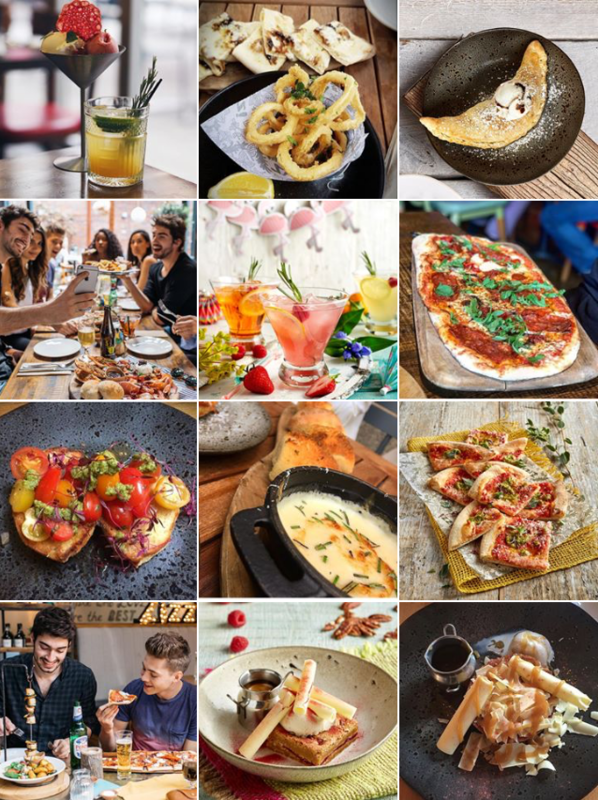 Even without factoring in those additional people, it’s still clear that if you run a restaurant or cafe – Instagram marketing is well worth investing in. However, the purpose of this data is to serve as an example only. Every business is different, so you’ll need to amend the input numbers to generate the numbers for your own hospitality venue. Now that you’ve seen the numbers, there shouldn’t be a doubt left in your mind that Instagram is THE social media network for your restaurant. But how do you use Instagram to grow your business and build a passionate and loyal following? Here are three tips that will get you closer to the results you’re looking for. If you don’t have an attractive and fully-optimized Instagram account, be prepared to lose a lot of potential customers. Your account is your business’ face and an online representation of who you are. So, make it great! If you’re a local business, add in your address and make sure your customers can geotagging your location. Hashtags are a powerful tool on Instagram and a great way to get your business found. So, do some research and find hashtags that are both, appropriate for your business, and popular on Instagram. And many more. The great thing about Instagram is that, unlike Facebook and Twitter, you can share up to 30 hashtags and it won’t look like you’re spamming your followers. 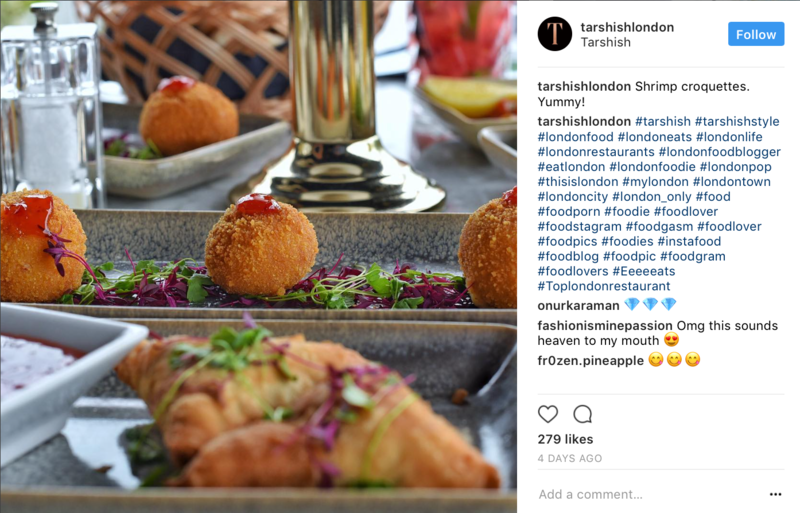 You can even register your own hashtag and encourage customers to use it while sharing photos of their meal or dining experience at your venue. According to Later, an Instagram scheduling tool, the best times to post are lunchtime (11am-1pm) and evenings (7-9pm). If you’re just getting started on Instagram, it’s probably a good idea to start with those times. BUT that’s just general data, and may not work for your specific audience. I suggest you try posting at different times and see when your audience is online and the most engaged. Then, simply adjust your posting schedule accordingly. With so many social media platforms out there, many brands forget about Instagram, and that’s a huge missed opportunity. 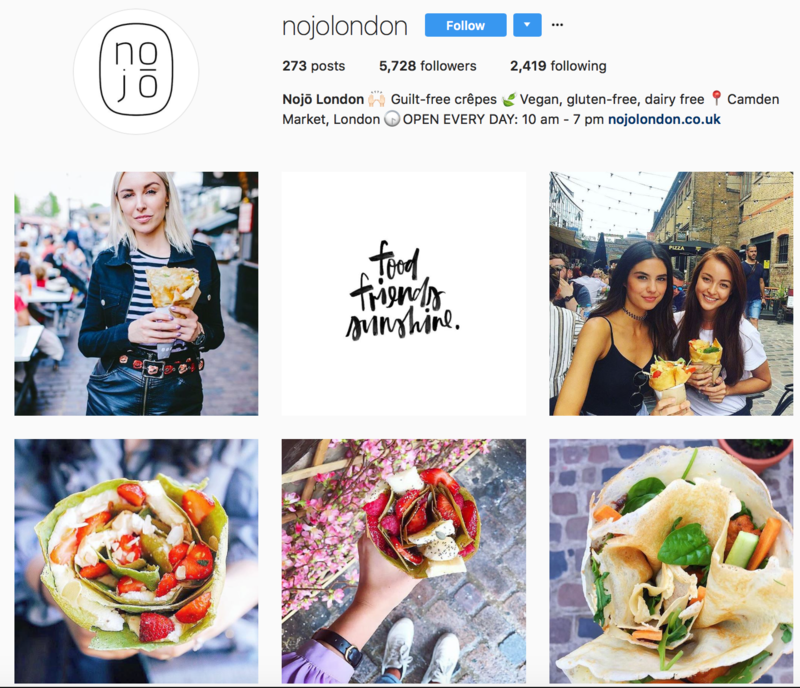 Instagram is an incredibly powerful platform for marketing your business – especially if you’re in the food industry. So, go out there and market your business on Instagram! If you’re not sure how to do it or simply don’t have the time, get in touch for a free 60 minute strategy session to see how our Instagram agency can help you. Also, if you’re looking for some other cool ways of marketing your restaurant, check out this roundup with advice from expert restaurant marketers. Research conducted through Instagram Advertising from May to June 2017. Targeting male and female between ages of 28 to 45 who are located in London and are interested in food. 158 respondents in total (even split between male and female).